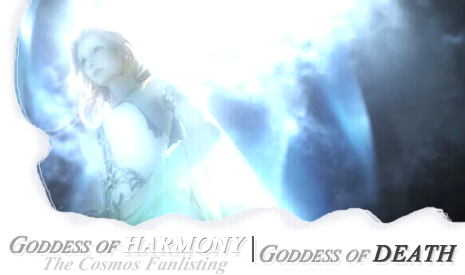 Welcome to Goddess of Harmony, Goddess of Death the fanlisting for Cosmos from Square-Enix's Dissidia Final Fantasy and its prequel, Dissidia 012 Final Fantasy. This fanlisting is part of The True Kindness Network and is listed at theFanlistings. If you are a fan, please consider joining the fanlisting. Goddess of Harmony, Goddess of Death is © Veronica.